Matcha is easily one of the healthiest teas you could ever drink. It contains antioxidants, amino acids, chlorophyll, and more. Matcha is helpful for detoxing, acts as a mood booster, and can increase your mental focus. And those are just a few of its benefits! To learn more about the health benefits of matcha tea, where it’s grown, and how to make your own, keep reading. To put it very simply, matcha is a kind of green tea. Regular green tea takes components from the tea leaf and steeps them in hot water. With matcha, the entire leaf is used; it’s ground up into a fine powder. Matcha is mixed with hot water and then, using a special kind of whisk, is mixed into a froth. One of the reasons why matcha continues to grow in popularity is because of its numerous health benefits. Antioxidants in green tea called catechins are known to support the cardiovascular system. Since matcha is a potent form of green tea, its catechins are more potent, too. One study, published in The American Journal of Clinical Nutrition, found that catechins from tea may reduce the risk of mortality from heart disease. A separate study published in Stroke found that drinking three cups of green or black tea every day could could prevent stroke. 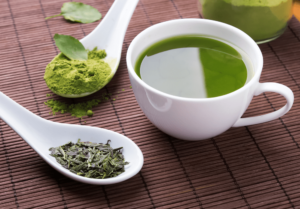 Matcha green tea may even improve healthy cholesterol levels. An analysis of numerous studies found that consuming green tea resulted in a significant reduction of LDL cholesterol. Researchers have found that drinking matcha tea regularly can help boost the rate at which your body burns calories, called thermogenesis. The study showed the rate of thermogenesis without matcha was 8-10% and with matcha, jumped to 35-43%. Some of the antioxidants in matcha are called polyphenols. These antioxidants can act as food for the good bacteria living in your gut. With healthier good bacteria comes improved gut health. So, drinking matcha can help improve gut issues like bloating, gas, and upset stomach. Studies show that drinking matcha can help improve brain health. 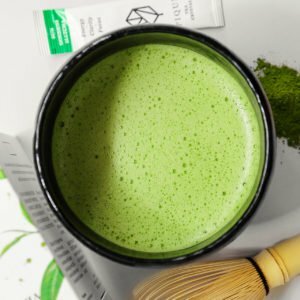 A study done in 2017 showed that adults who drank matcha showed better reaction time, memory, and attention compared to the adults who didn’t drink matcha. Another study, this one done in 2014, showed that drinking green tea powder every day for three months may reduce the progress of cognitive decline. Matcha contains L-theanine, an amino acid that’s known to help you feel calm and relaxed. Matcha has 20mg of this amino acid, as compared to other green teas, which only have 4mg. Matcha contains caffeine, which is why some people have replaced their daily cup of coffee with it. On top of that, the L-theanine pairs well with that caffeine, creating a calm sense of alertness and focus. Matcha is a good alternative for those who are prone to coffee jitters. Chlorophyll is potent in matcha; it’s what gives this tea it’s vibrant green color. Chlorophyll is a powerful detoxifier and effectively rids your body of chemicals and heavy metals. Chlorophyll exists in other green veggies, but matcha is especially rich with it. Another reason why so many people love matcha is because of its caffeine content! Matcha tea contains about 34mg of caffeine in a recommended serving. That number is a little higher than green tea, which has 30mg of caffeine, and lower than coffee, which has 60mg. Something cool about the caffeine content in matcha green tea is that it can last longer than other caffeinated drinks. That’s because the amino acid, L-theanine, that’s in matcha, paired with the caffeine, can give you the alert, mental clarity and focus without the jumpy jitters so often associated with caffeine. There are different kinds, or grades, of matcha green tea. There’s little to no difference in nutritional value, but there is a difference in taste and quality! There are two broad categories for matcha: ceremonial and culinary. For more than eight centuries, a tea ceremony has been a sacred ritual in Japan. 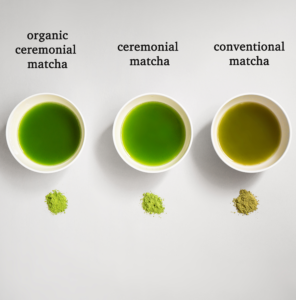 Tea masters used matcha tea in the ceremony, and used only the highest quality matcha. That’s where ceremonial grade matcha gets its name. You probably figured out what’s special about this grade; it’s the highest quality matcha you can find. Ceremonial grade tea is made with first flush leaves, meaning they are the youngest, most tender leaves plucked during harvest season. These leaves are said to yield the purest, freshest tea. When ground, these leaves are a bright green color, and when whisked, result in a creamy, frothy drink. Each additional flush after the first can be considered culinary grade matcha. There are no clearly defined guidelines or rules to determine what constitutes culinary grade matcha, but there are a few distinctions. Culinary grade matcha tends to have a lighter green color and an increasingly bitter taste, depending on which of the 5 categories it’s in: Prime grade, Cafe grade, Ingredient grade, Classic grade, and Kitchen grade. 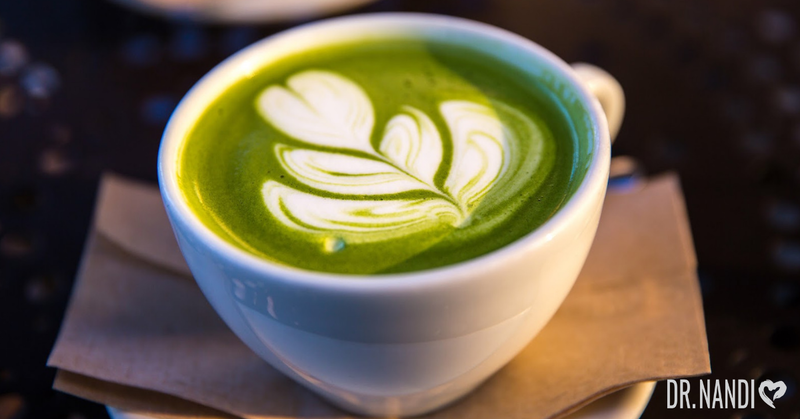 Culinary grade matcha is typically less expensive than ceremonial grade, easier to come by, and is popularly used in mixed beverages, like lattes, or in baked goods. Matcha is one type of green tea. The major difference between matcha and other teas is that matcha is made using the entire tea leaf, whereas other teas are made with only parts of the leaf. 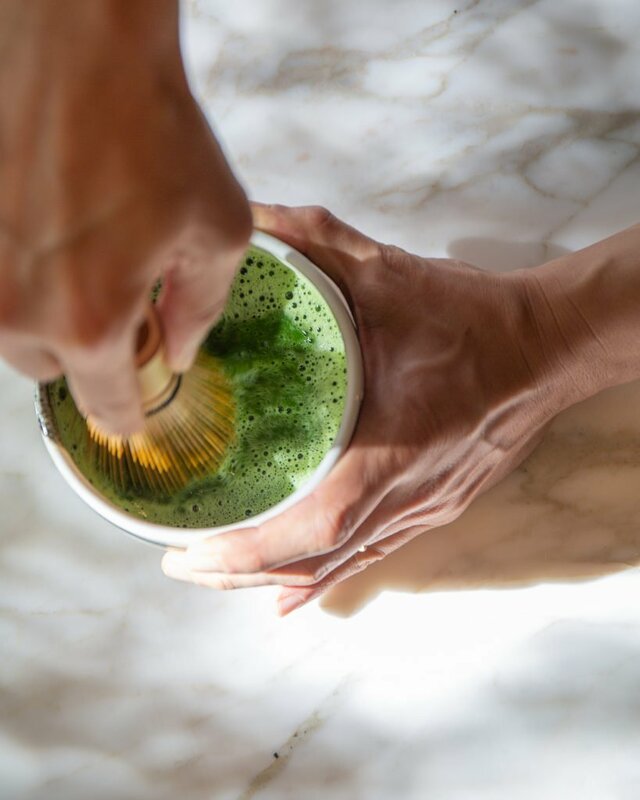 Matcha is made by grinding up the leaf into a fine powder and whisking it together with water to create a froth. Other teas are simply steeped in water. Farmers have been cultivating matcha for close to 1,000 years. It comes from the same plant that grows green and black tea: the camellia sinensis bush. Matcha originates in Japan and the highest grade of matcha still comes only from a few select regions: Uji, Yame, and Kirishima. There’s a very specific way to make matcha. While these steps aren’t difficult, they are precise, and should be followed exactly for the best matcha. First things first. There are two different types of matcha you can make. The standard version is usucha. The other kind is koicha, which is thicker and richer. Materials you will need include a whisk, sifter, and small bowl or large mug. A bamboo whisk is ideal because it’s uniquely designed to froth the tea. A sifter helps remove any clumps from the power. The bowl is for sifting the matcha and water. You’ll be drinking out of the same bowl or mug that you mix your matcha in. Once you have those materials, you’re ready to start making matcha. Sift 1-2 teaspoons of matcha powder into a bowl. Two teaspoons results in a richer, thicker matcha, called koicha. Pour 50-70 ml of almost-boiling water into the bowl. For rich koicha, use only 50 ml. For the weaker usucha, use 70 ml of water. With the whisk, slowly start at the bottom of the bowl, picking up the powder. After that, quickly whisk the top half of the liquid in a W shaped squiggle, without touching the bottom of the bowl. For the best taste and texture, drink your matcha within 3 minutes of making it. Otherwise, it will lose its frothy texture and the powder will start to gather at the bottom of the vessel. Some health trends are fleeting, but matcha green tea is the real deal. With powerful amino acids, antioxidants, and chlorophyll, matcha delivers health benefits to its dedicated advocates. If you’re sensitive to caffeine, matcha might not be for you. But for others, matcha is definitely worth a try. 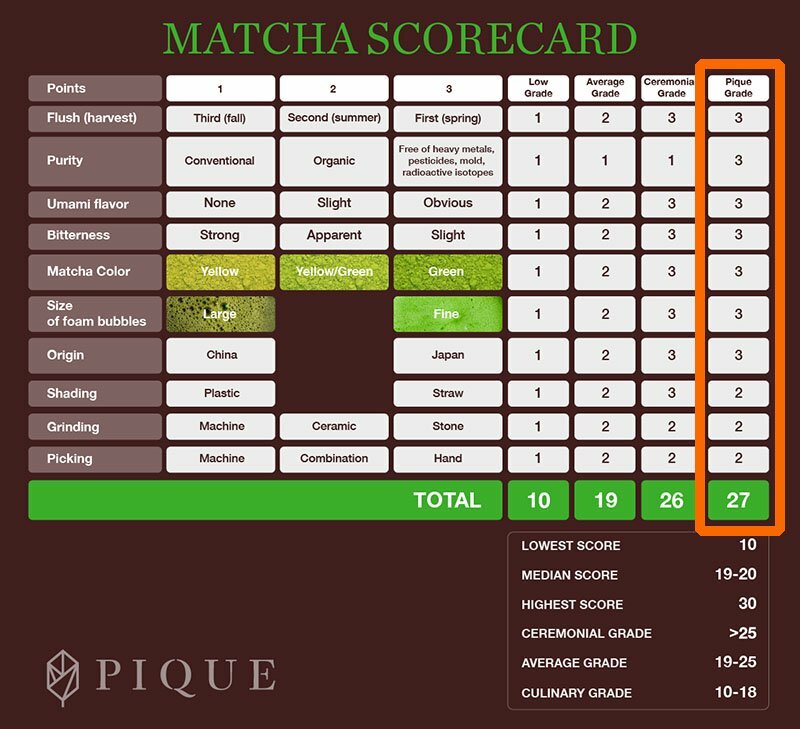 One of my favorite matchas is Pique’s Sun Goddess Matcha. 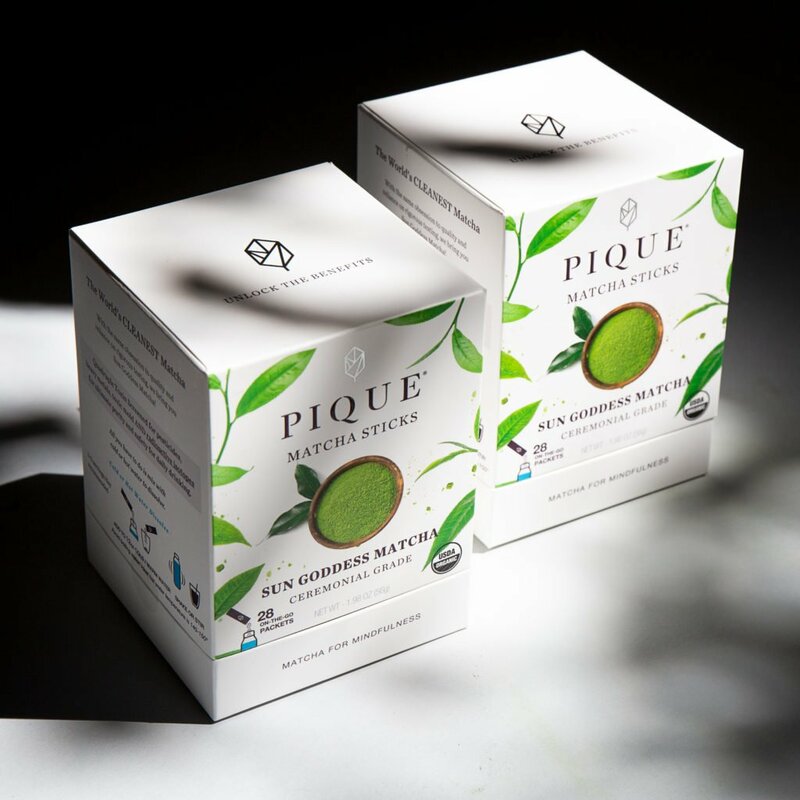 It is the world’s purest organic ceremonial grade matcha to Quadruple Toxin Screen for heavy metals, pesticides, toxic mold AND radioactive isotopes. This matcha comes from Kagoshima, the furthest point from industrial pollution and radiation in Japan. 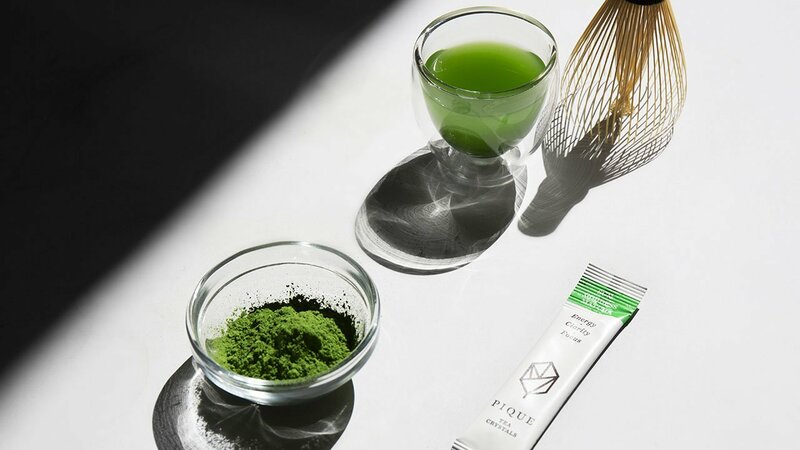 This matcha tea also maximizes its health benefits because the tea leaves are shaded 35% longer to produce more amino acids, including calming L-theanine. Not to mention, it has an incredible creamy umami flavor that is sure to delight. You can check them out here!